If the lines on Sunday were any indication, there are probably a lot of you in smaller towns spread across America that still haven't gotten to see Star Wars: The Force Awakens yet. So take caution. This story is filled to the brim with Spoilers. We suggest you go watch the movie, and then return to see how the plot changed and evolved over the course of a few years leading into production. At one time, the story was set to focus on Han, Leia and Luke's offspring. One of the earlier drafts even gave a lot more screen time to Master Jedi Skywalker, who ends up being in the finished movie for nearly one minute. 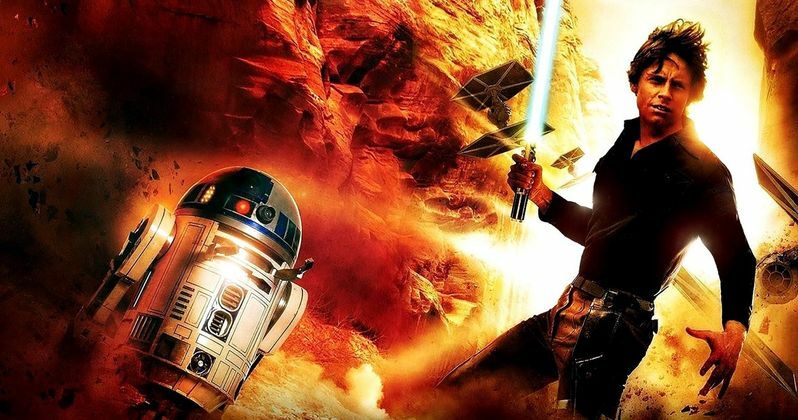 The early Star Wars: The Force Awakens drafts are an interesting what if? Leading up to the film's release, director J.J. Abrams remained reluctant to talk about any of those aspects when it came to the development process on this long awaited sequel. And those journalists that tried to pry answers out of him didn't have much luck. This, despite the fact there is a rich untold story lurking just inches below the surface. As far back as 1976, creator George Lucas had ideas for Chapters 7, 8 and 9. Those ideas were abandoned by LucasFilm and Disney almost immediately upon sale of the company. George Lucas has hinted that this was being set up as a generational story, with a trilogy that would focus heavily on the trinity's force-enabled children. And as we know now, some of those aspects were kept in tact. But very thinly. Pixar screenwriter Michael Arndt was brought in as the first writer on Star Wars: The Force Awakens, but he bailed early in the process. A report from THR suggests that the writer was leaning to heavily on the children aspect. When J.J. Abrams and Lawrence Kasdan took over writing duties, they decided to bring Han Solo, Princess Leia and Luke Skywalker back into the foreground, making them a key part of the plot. At one point, Tye Sheridan was being tested to play one of the offspring. The character was in his twenties. But that role was completely scrubbed from the script. Over the weekend, J.J. Abrams and Lawrence Kasdan were joined by Michael Arndt for a Q&A session in Hollywood immediately following a screening of the movie. It was here that the trio decided to open up about what could have been. One of the key changes from the earlier scripts is that Mark Hamill would have had more screen time, and was a major part of the plot. Michael Arndt had this to say. While we get to see Darth Vader's burnt helmet in Kylo Ren's shrine, with the Sith wannabe taking council with his grandfather, this aspect of the movie was quite different from the first drafts as well. This sequel actually had an underwater sequence where Kylo Ren retrieved Sith artifacts from the Death Star wreckage. And it helped explain how Vader's helmet was retrieved. Even though we don't see it on screen, what Michael Arndt says next explains a lot. But we're not sure if this is canon. "A search for Darth Vader's remains, or a quest to the underwater wreckage of the second Death Star to recover a key piece of history about sacred Jedi sites in the galaxy." This would have made Star Wars: The Force Awakens a completely different movie. And while some have complained that the finished version in theaters now has too many 'remake' aspects, and plays like a remix, the original script had none of that. Along with Luke Skywalker, R2-D2 and C3PO also had a bigger role to play in the story. This is what Michael Arndt had to say about that aspect of the original plot as it was first being laid out. "I had originally written R2 and C-3PO showing up together, and Larry [Kasdan] very intelligently said, 'You want to keep them separate from each other. And of course I'm like, 'No, no, no, Larry. You don't get it at all!'" This aspect is not in the movie, because J.J. Abrams felt it was dragging down the plot. The idea is introduced indirectly. The idea is that when we see R2 plug into the Death Star while trying to save Luke, Han and Leia from the trash compactor, he downloaded the entire archives of the Empire. This is referenced by Kylo Ren in the actual movie. But not spelled outright. What brings him out of the coma is BB-8, who tells R2 that Luke may have been located. This serves as an 'awakening' for the droid as he comes out of his droid coma. "BB-8 comes up and says something to him, which is basically, 'I've got this piece of a map, do you happen to have the rest? The idea was, R2 who has been all over the galaxy, is still in his coma, but he hears this. And it triggers something that would ultimately wake him up." What do you think? Do you love the movie you got? Or do you wish Luke Skywalker would have on screen for more screen time in Star Wars: The Force Awakens? Are you sad that Luke and Han will never have a new scene together? And do you buy the whole business about R2-D2? Sound off below.